Most live musicians will be aware of just how important it is to look after your musical instrument, even when it is not in use. Temperature and humidity are factors which can contribute to damaging an instrument as they can lead to cracks, warping and shrinkage if not managed. If you make the effort to maintain your guitar or musical instrument, you will get a much longer, more improved life out of it. To enable you to do this, Planet Waves have released the Humiditrak. This is a new and innovative compact device which monitors the surrounding climate, temperature and impact to prevent damage occurring to your instrument. This clever little gadget functions by being placed either inside an instrument or its case, and it uses Bluetooth to send updates straight to your smartphone. Bluetooth enables the Humiditrak to monitor the conditions in real time, and you can track the status hourly, daily or monthly. If you're on the road, you can also be sent push notifications which give you an instant update if your instrument is being subjected to an unsafe level of humidity, or even if it has taken an impact when on the road. By having these real time updates, you can take action before any damage occurs. 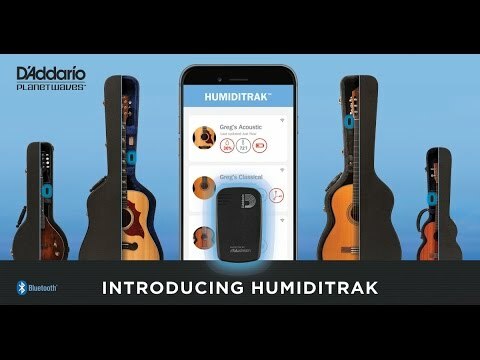 You can install the Humiditrak in various instruments, not just one, and you can keep track of them all using one app which has an easy-to-read interface on your smartphone. The app can be downloaded from the iTunes App store or Google Play. The HumiditraCR2032 battery included. Maximum battery life of 2 years. For the modern day musician, the Planet Waves Humiditrak is an ingenious piece of kit to have, ensuring that all your favoured instruments are well looked after, thus providing you with an improved playing experience as well as a much longer life for the instrument itself by avoiding any potential damage.